When the prophet Isaiah penned these beautiful words, he was speaking at a time of great upheaval. Isaiah was speaking to the faithful remnant of followers who had returned to Jerusalem, after 40 years in exile, only to find their temple in ruins. These were the words spoken in the midst of fear and despair. They grieved a future that was not supposed to be. Our nation is in the grips of a presidential transition that some welcome with excitement and others react in fear and trepidation. The future of our nation is uncertain. But as Isaiah so beautifully described, God’s future is not uncertain. God is already at work, redeeming what is and creating what will be. We already know how the story will turn out. We in the church remember that God holds our future. God’s future is not hateful or dismissive or confused. God’s vision is creative, participatory, and filled with joy. That is the future we claim and that is the future we build, with God’s help, here at Oak Lane Presbyterian Church. Let us move into our future, with hope and with joy, keeping our eyes and hearts fixed on God’s vision. Let us be faithful to the work before us, as we participate in God’s story for all humanity. Rev. Judith Brackett can be reached by calling or emailing the church office, or by calling (610 747-0366) or emailing (revjudithbrackett@gmail.com). One Sunday morning in early July, I arrived at the church, unlocked the office, and saw the window open to the early morning breeze. Looking down, I saw computer parts scattered on the floor. As the temperature was already in the high 80’s with high humidity, I assumed a smash-and-grab thief broke in only for the window air conditioner. After taking stock, though, we discovered that the office computer was missing. With particular gratitude to members of the Property Committee, we end the summer with more thorough, cost efficient, and updated office and building systems. This summer of questions was met as an opportunity to question, share, seek, and act. Nearly two months later, I remarked to Session that although we would never have wished for this break-in to occur, all it uncovered and opened to us has been most fruitful. This September marks one year of my pastoral ministry with you. For me, the past year has been a time of fruitful questions and enlightening conversations. – Why do we do that? What purpose does that serve? How might we modify this to refresh its impact? I am grateful for your patience in considering the questions, and inspired by the thoughtful conversations we have had and will continue to have. As we prepare to celebrate our 125th year of ministry at OLPC, let us welcome the Spirit in our midst, who sometimes comes among us like a thief in the night, prompting us to a thoughtful re-ordering, re-orienting, and refreshing our ministry here at OLPC. The higher temperatures are setting us into summertime motion; worshipping in the air-conditioned Campbell Room, beginning worship at 10 A.M. to evade the afternoon heat, and suspending some meetings to allow time away. In June, I will be attending the The Engle Preaching Institute at Princeton Theological Seminary, followed by a week in Portland, Oregon for the PC(USA) General Assembly. I’ll end the month with a week’s vacation with my family in the Pacific Northwest. July offers some new opportunities for learning and fellowship. Each Sunday following worship, all those interested are invited to brunch and a discussion about the national landscape of the Presbyterian church, religious trends, and thought-filled implications for the future. Each stand alone gathering will include a timely article to give us a conversational jumping off point. I’ll accompany Elisha, Daraja, and Seth to Indiana for the PC(USA) Youth Triennium in late July. Traveling by overnight coach bus, sleeping in a college dorm, and participating in the 4000+ youth gathering, I’m ironically expecting to be rejuvenated by this experience! In August, I’ll return to The Collegeville Institute in Collegeville Minnesota, for a week of writing and writing instruction. I’m confident time there will provide a time of rest and renewal. The summer of 2016 at Oak Lane Presbyterian Church will lead us to a time of celebration of our 125th Anniversary in the fall months. Look for more information as plans develop and ideas bloom. Wherever your summer travels take you; to the shore, to a family reunion, to your own backyard shade, know that the One who created the world and pronounced it good, also savored time to rest. May you summer be filled with awareness of God’s goodness, and may restful rhythms attend your summer days. This year, Pentecost falls on Sunday, May 15th, and the day we wear red as a visual commemoration of the fiery and energizing gift of the Holy Spirit. On Pentecost Sunday, we will have a pre-worship breakfast to celebrate what the Spirit is birthing in our midst. We will gather in deep trust and bold confidence that the Spirit fills the empty places and uses her people to continue the ongoing work of creation. The morning will include a festive “showering” of gifts – items new and gently used to outfit the manse kitchen, making it ready for meals and meetings that extend and enrich our ministry here at Oak Lane. The Spirit blows where it pleases, inciting both fear and excitement. Assembled together over breakfast and in worship, we will welcome the fierce and purifying power of the Spirit that has been entrusted to us. On Pentecost and in the weeks and months ahead, we will attentively listen and watch for possibilities born of the Spirit, as we are willingly swept up into God’s good and holy purposes. All are invited! Contact Helen Hampton to coordinate what you would like to contribute, though gifts are not necessary to attend. Coffee will be brewed beginning at 8 o’clock. See you on Pentecost Sunday! We are for one another. We are generous. We speak words that help. We build one another up. And summed up in the affirmation – WE ARE ALL ON THE SAME TEAM. At last month’s Session meeting, church leaders re-affirmed our commitment to supporting and maintaining the Oak Lane After School Program (OLASP), which provides childcare both before and after school. We understand that our outreach to neighborhood families with school age children is integral to our missional witness. This is no small statement that yes, we indeed care about the children we serve. We do care…. and tend, and advocate, and discipline, and love. Because caring for children at OLPC is indeed a matter of demonstrating love that was first made known to us in Christ Jesus. As your pastor, I understand my role and responsibility to include being pastorally present with the children and their families in our care. I enjoy my time “downstairs”, checking in with staff, reading a picture book, helping with homework, building with Legos, or tying a shoelace. My time with OLASP has increased these last few weeks, as OLPC ruling elder Theresa Purnell and I are volunteering as interim co-directors. A search is already underway to find a permanent OLASP Director. This week, when the children arrived with typical release of pent up energy kept under wraps during the school day, they noticed some changes in the physical space. Tables with activities were prepared in advance of their arrival and a quiet classroom has been established for those who have homework. We removed a few tables to allow space for inside games. Though these changes are an improvement, the most important work is teaching and modeling expectations of how we treat one another. Easy to say, difficult to live, as feelings get ruffled, emotions become tangled, and actions precede thought. These expectations set a high standard, yet anything less would betray our Christian understanding that we belong to one another in covenantal relationship. Children, adults, neighbors, strangers, – we are entrusted to one another. There is no other that is excluded and left behind. Our theologically informed ways of being together affirm the love made known to us in the life, death, and resurrection of Christ Jesus. The love made visible “downstairs” is the same love we worship on Sunday morning, the love we seek in prayer, and the love we share in our work and witness. May all our relationships reflect the glory of the risen Lord who inspires our efforts and informs the way we belong to one another. With cell phone camera in hand, I went out the red corner doors into the dark evening. I turned around and saw the glowing reverse image of our large colored windows. In daylight, the sunshine outside brightens the colors inside. This night, the light inside illuminated the darkness with vibrant beauty. These words of scripture from the Gospel of John were read each Sunday as we lit the candles on our Advent wreath. Both an announcement and a promise, the light of our revealed Savior is the good news which we proclaim with our lives and cherish in our hearts. 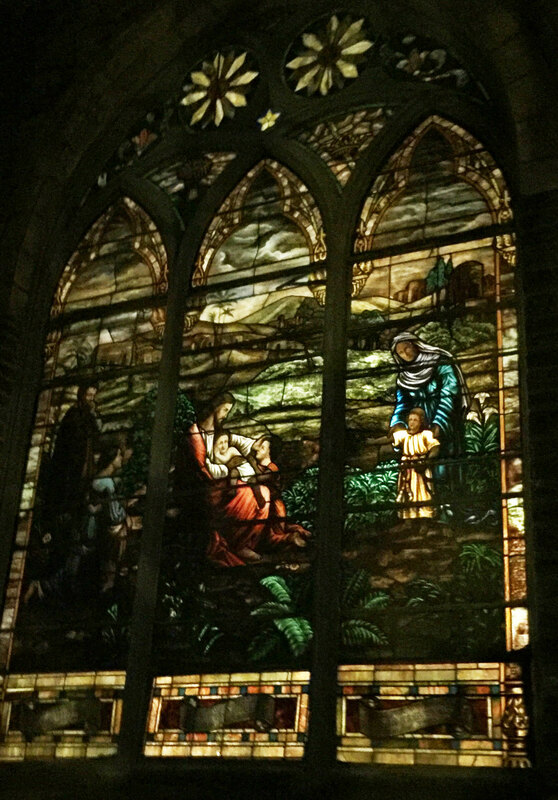 The light of Christ glows within this church. Through members tended, food donated, meals shared, children hosted, money collected, Communion served, and meetings attended, we are the church, making Christ’s light shine in this place. This calendar year, we celebrate the shining light that is The Oak Lane Presbyterian Church as we mark our 125th year on this corner. Let us take into this new calendar year the image of the light within that illumines the darkness. May the light that shines within each of us, and within the church gathered, inform our work, inspire our witness, and ignite in us new possibilities in our 125th year. We are a couple weeks away from Advent, the beginning of a new church year. Moving closer to this changing of the liturgical season, I am hearing details and tales of cherished traditions from Advents past. Several people have spoken to me about a vintage nativity set that has not been in use for a number of years. While un-cluttering the Gardner Room, I discovered boxes of the bubble wrapped holy family and their adoring visitors. I am thrilled to report that Joseph has been re-glued and is ready to kneel in awe over his new son. And thanks to the work of clearing out a corner of the sanctuary, this year there will be room at Oak Lane for the Christ child to lay his head. Cherishing the past. Un-cluttering. Kneeling anew. Making room. Sounds like the essential ingredients of something brewing among us at this time, in this place! In late October, I recommended to the Session that we suspend all December committee meetings. Citing intense busyness and visible exhaustion, I would like us to embrace Christ’s coming again with as much simplicity of schedule that we can allow. Instead of meetings, I have asked that we gather for meals, three Wednesdays in December, to break bread and share fellowship. For some, December races by in a blur of activity. For others, a melancholy silence has replaced the bustle of the way it used to be. Wherever this Advent finds you, I invite you to find a place here, in Sunday worship, on Wednesdays at the table in the Social Hall, and at our holiday special events. May we prepare our hearts and minds for the possibilities being birthed in us this Advent.